Hedgehogs are considered the gardeners friend, but we may not be that friendly towards them as our gardens can contain many hidden dangers. Here are some ways that we can reduce these hazards. Many slug pellets contain Metaldehyde (commonly the blue ones but check the ingredients on all slug pellets) and will not only kill the slugs but can also kill the hedgehogs (and birds) if they eat one of these victim slugs. Try alternative natural slug deterrents such as Slug Gone and Copper Slug and Snail Tape that are safe to all wildlife. We are all being encouraged to recycle but empty food cans, yoghurt pots, plastic cups etc. are a real danger to inquisitive hedgehogs and small animals which can get stuck in them head first and die of starvation or suffocate, to prevent this squash all cans, and cut up containers before putting them into the bin. Wildlife can also get caught in the plastic rings that hold the cans together and the different sizes of holes in them can trap different types of animals, each circle should be cut up before putting them in the bin. These have been banned in America we hope that our government will ban them too. These attract wildlife to our garden but if there is no escape route anything that falls in will be unable to climb out and drown. Hang some plastic coated wire over the side and into the water to make a ladder, half submerge some rocks around the edges or make a gentle slope on at least one side of your pond. Keep ponds topped up, especially in hot weather so that hedgehogs are less likely to topple in. Children’s paddling pools and sand pits are also a danger when filled with rainwater. Keep all pea-netting a foot above the ground so the hedgehogs can go under it and will not try to go through it and become stuck. The same applies to tennis nets, children’s football nets etc. Before burning accumulated rubbish in the garden or before emptying or turning your compost bins check that a hedgehog has not made a home in it, the best time to spread the heap is October/November. Take care when mowing long grass with mowers or especially strimmers, when cutting long overgrown areas cut initially to about a foot high and then check for hedgehogs and other wildlife before cutting any lower. We should all leave an area of our garden to go wild for nature, and this would be an ideal place to put a hedgehog house these provide a safe haven for hibernating hedgehogs and also for females to have their young. Ideally place the house somewhere quiet against a bank, fence or wall and out of prevailing wind. 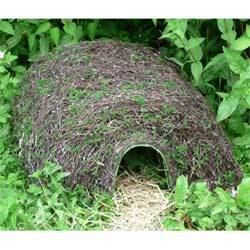 We have the perfect Hedgehog home at The Recycleworks the Hogitat it is an attractive natural home and safe retreat for hedgehogs which will comfortably nestle into any garden. So let’s do all we can to help our adorable prickly friends.